No need to be afraid of the dark - here is a wonderful collection of stories about the creatures and personalities who live at night and sleep in the day. . . .I saw him. Yet nearly all the trouble that Raccoons have is on account of their fur. Never try to show it off." The time came for the young Raccoons to stop drinking milk from their mother's body, and when they tried to do so she only walked away from them. "I cannot work so hard to care for you," said she. "I am so tired and thin, now, that my skin is loose, and you must find your own food. You are getting forty fine teeth apiece, and I never saw a better lot of claws on any Raccoon family, if I do say it." Adorable and enchanting. It also teaches about night animals habitats, habits and lives. I adore these creatures. This has been an adventure from beginning to end! So many lovely characters, and more importantly, lessons to be learned! 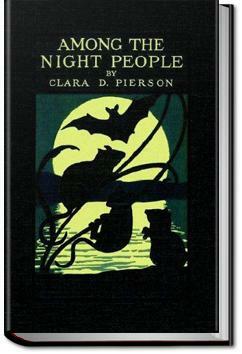 I'd have to say my favorite stories would be The Nigh Moths Party and both of the ones about the Raccoons. Vert cute, well-written stories that appeal to all ages. I am looking for good literature for my kindergarten-age son. He loves nature and amusing stories and I feel this book is perfect for him. I myself enjoyed reading it and learned little tidbits of information about nocturnal animals. All of Pierson's nature books are must-reads to get kids interested in the natural world. She really brings animals to life in these books. Such fun! A great children's' book that teaches a lot of great life lessons.